I loved the transparencies that I saw on so many other pages today I hunted some out. They are only plain ones, supposed to be for an overhead projector. I think I’ll use them for divider strips. Today’s has some felt stars stapled on. I want to try out stitching and stayz-on and maybe paint as well though. But not today! …will let you know how it goes. Will also try to take pix in the daylight in future; but getting this set up to post tomorrow was too tempting. 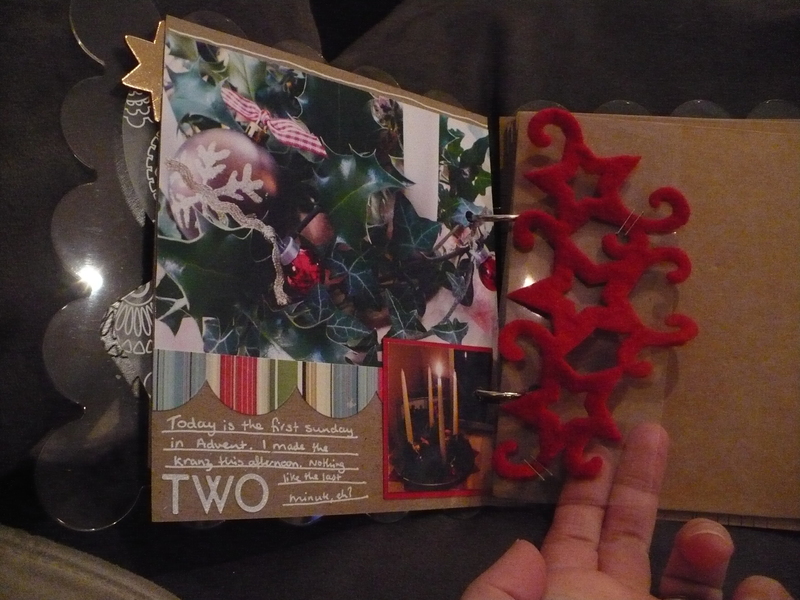 I have tried making foundation pages versus making a new page everyday and I like the new page a day – I keep a stash of foundation pages in a separate album in case I get stuck. I really like what you created! Great page! This looks awesome! The photo is amazing and I love that stapled on felt so much. Great page! I too love transparencies, love how you stapled the felt stars on top! Lovely Advent wreath! I love the close up you chose for today’s picture.